Summer may be over, but fall doesn't have to be boring. 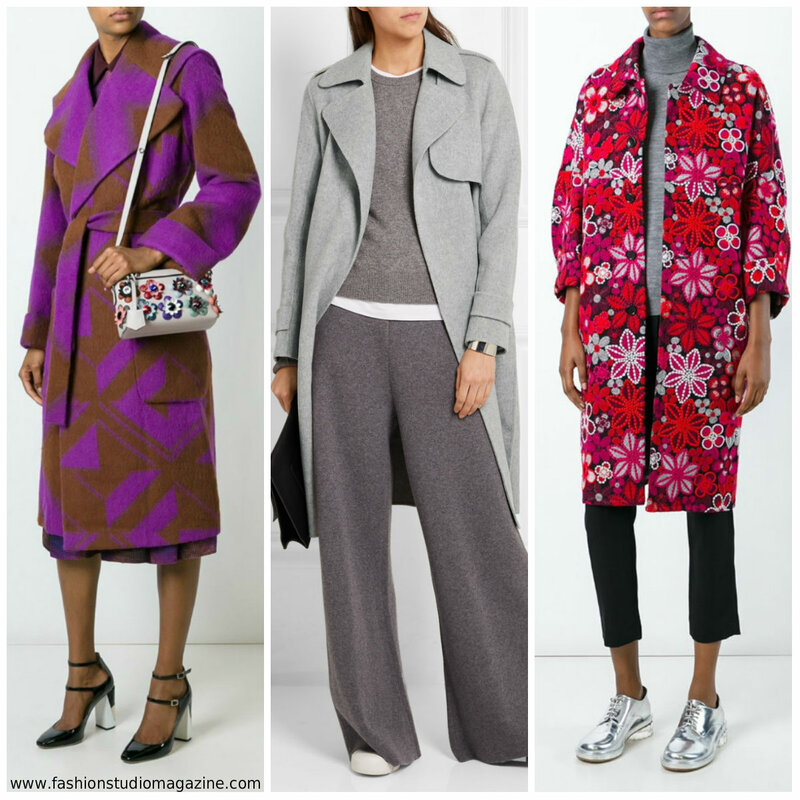 Fashion Studio Magazine selected six fabulous coats that not only look very stylish, but will also keep you warm. 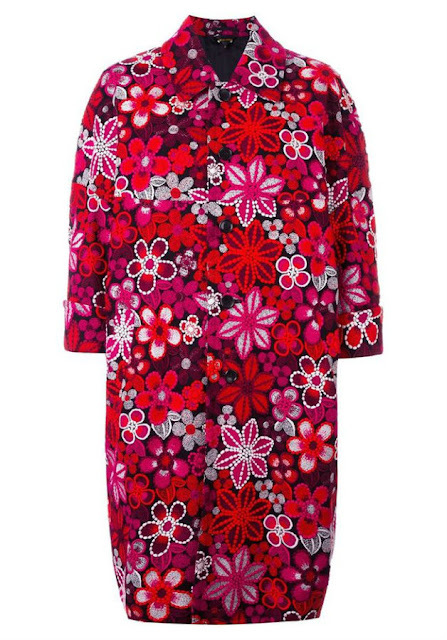 Trendy patterns and bold colours will brighten up gloomy fall days and won't allow you to disappear in the crowd. Have a look at the pictures below! 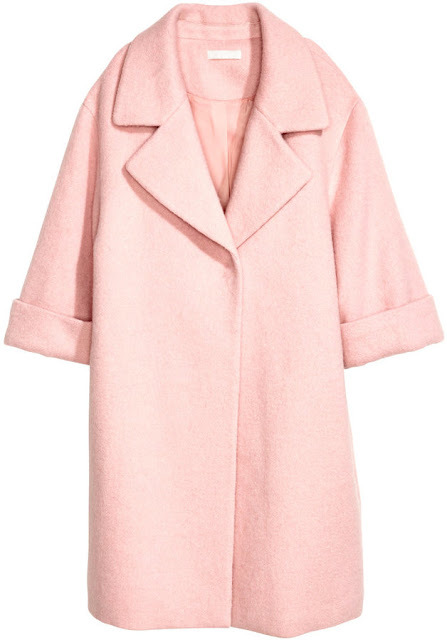 USEFUL TIP: If you are wearing a statement coat, remember to keep the rest of your outfit simple. Choose your accessories carefully and opt for classic black or calm, neutral shades. Recommended colours for Fall/Winter 2016: cream, pastel pink, grey, brown, purple, leopard print, floral print, and classic black. 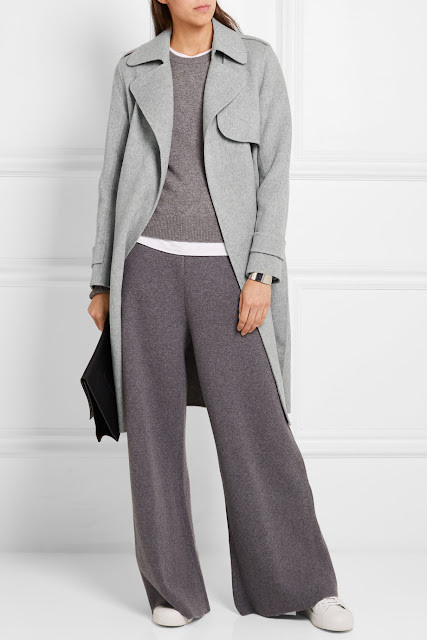 Straight-cut, knee-length coat in textured-weave fabric with wool content. Wide lapels, dropped shoulders, and 3/4-length sleeves with sewn cuffs. Concealed snap fastener at front and concealed side pockets. Lined. 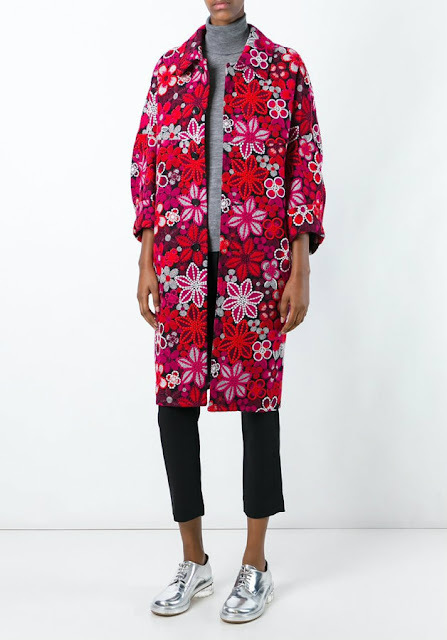 Pink cotton floral print coat from Comme Des Garçons. Rei Kawakubo’s avant-garde, conceptual designs for Comme des Garçons have prompted even the harshest critics to view contemporary fashion in a different way. The designer’s one-woman war against conformity has drawn comparisons with Chanel and Balenciaga. Straight-cut pile jacket with side-seam pockets, no buttons, and an imitation leather tie belt. Lined. 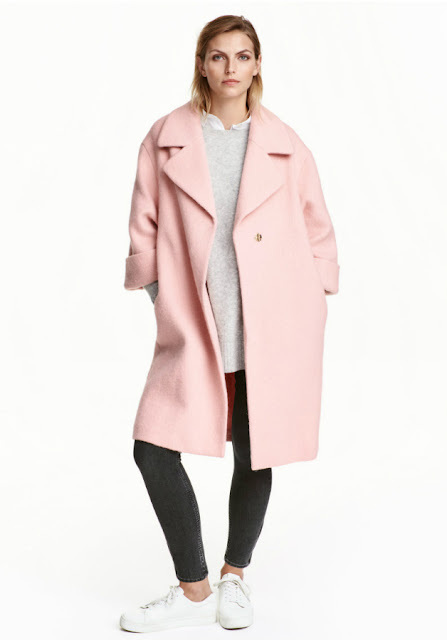 Theory puts a contemporary spin on the traditional trench with its pared-back 'Oaklane' style. 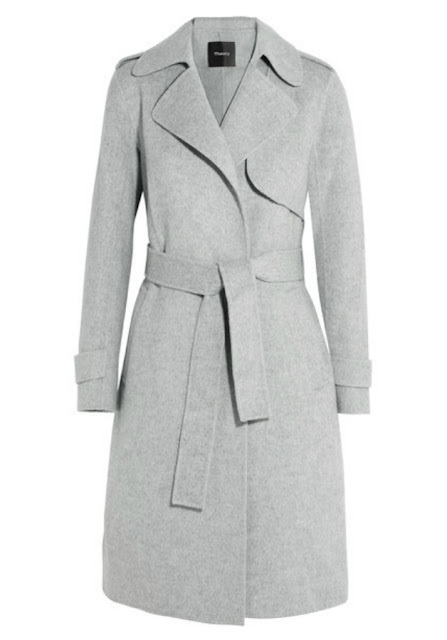 This light-gray coat is cut from a tactile blend of wool and cashmere that is brushed for added softness. It's detailed with classic epaulette shoulders, storm flaps and a waist-cinching belt. 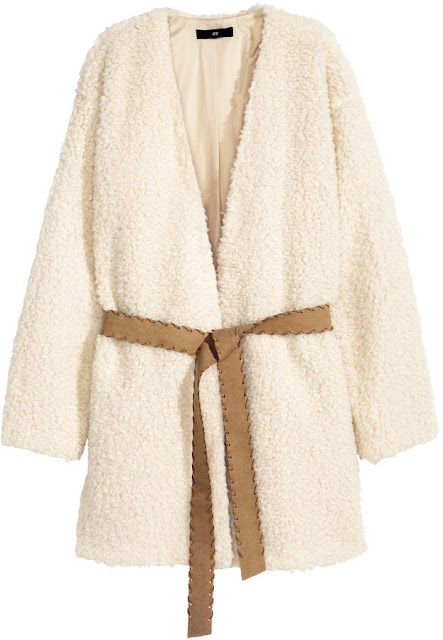 Call on yours for a touch of warmth on brisk fall days. 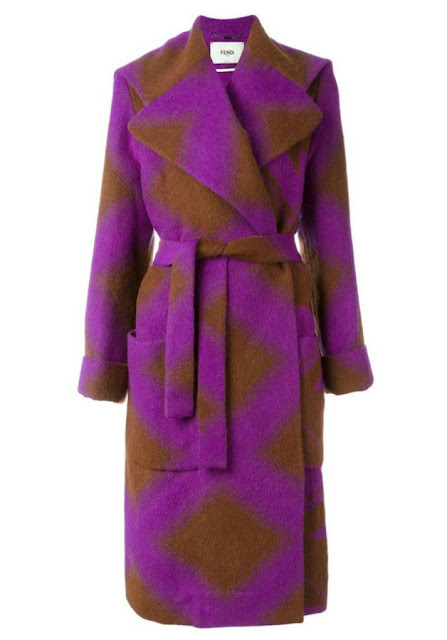 Purple and brown virgin wool diamond print coat from Fendi featuring a wide lapel, a double breasted front fastening, a belted silhouette, long sleeves, turn up cuffs, two front pockets and a mid-length. 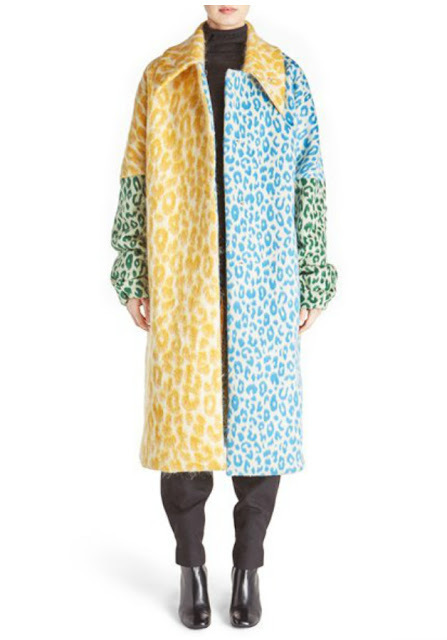 Saucy leopard spots dapple a fabulously color-blocked coat in a rich mohair-and-wool blend. Dramatically dropped shoulder seams and a bold, oversized collar perfect the look.